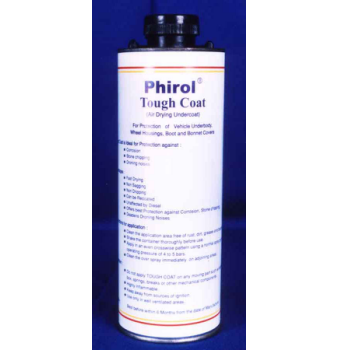 Phirol Air Drying Sealer is a one component air drying sealer developed for sealing joints and gaps in automobile bodies. It is ideally suited for bus body and coachbuilders who do not have a baking facility. 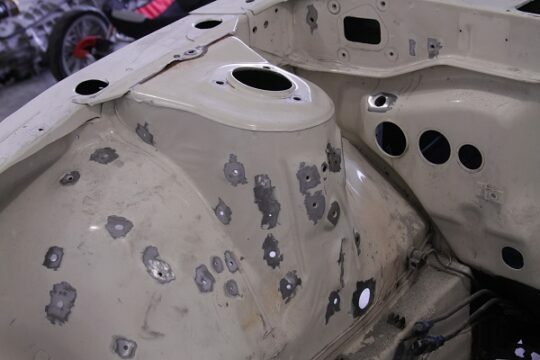 It can also be used by OEM's for patch work on painted chassis. Phirol Air Drying Undercoat Compound (Tough coat) is a Black colored compound specially developed for applying on the complete underbody of the automobile vehicles. Phirol Air drying undercoat compound is developed for specific target clientele, i.e. auto bodybuilders, authorized service stations and all automobile owners who service their vehicle at garages. Phirol Air drying Undercoat Compound has got good adhesion properties to pretreated metal surfaces.It can be used on the vehicle underbody, wheel housings, boot and bonnet covers. It offers best protection against corrosion, stone chipping and also deadens droaning noises. It can be recoated and is unaffected by diesel. Phirol Polyester Putty is a two-component putty specially developed for filling the dents and surface imperfections present on sheet metal surfaces. It has excellent sanding property. It is recommended for automobile service stations where denting and painting work is undertaken.